JST, Molex, AMP, Tyco and so on. 1000000 Piece/Pieces per Week For sample order, it needs 3~5 days. 1)Samples: About 3~5 Days; 2) Mass Products: About 2 weeks. Conntor brand JST, Molex, AMP, Tyco and so on. 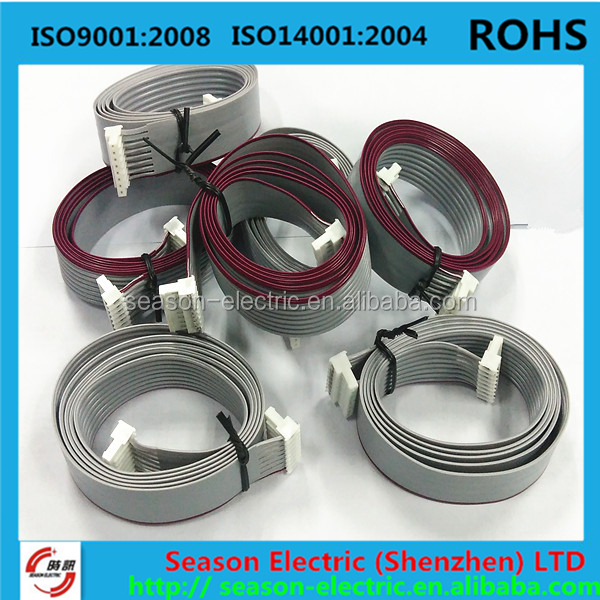 WIRE UL: UL1007, UL 1015, UL1061, UL2651 and so on. 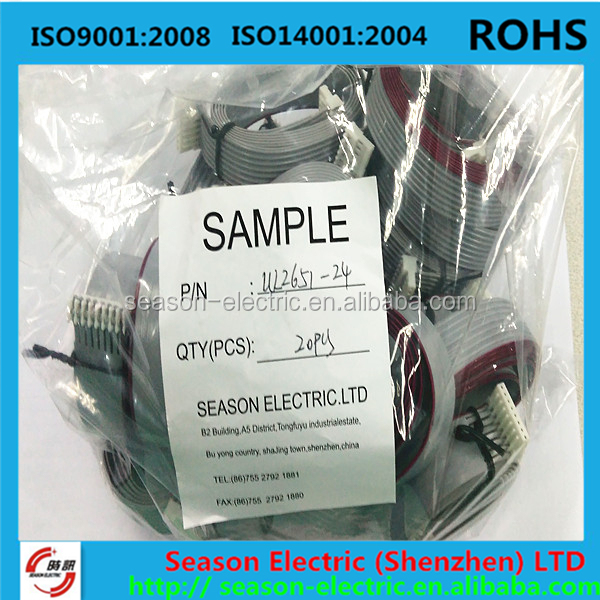 VDE WIRE: H03VVH2-F0.752/ 2C and so on. 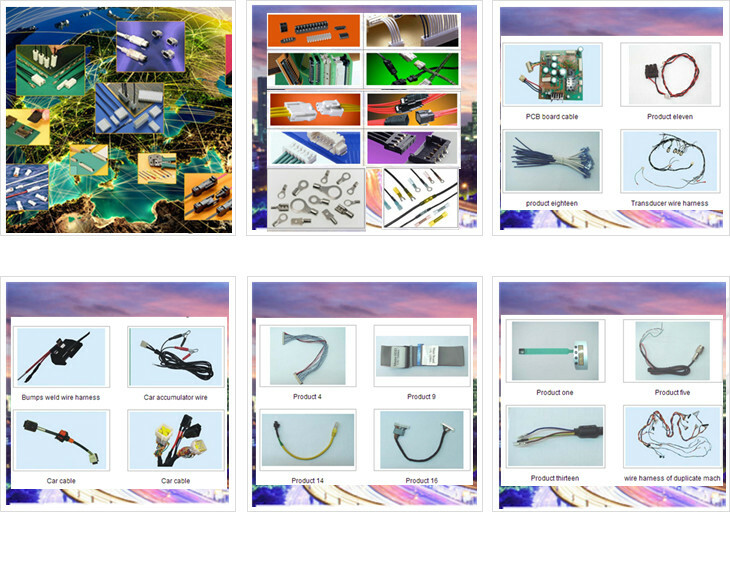 Application: we can do wire with connectors of all kinds of brand, home appliances wire harness, computer wire harness, TV wire harness, printer wire harness, LED wire harness, air conditioner wire harness, washing machine wire harness, car wire harness, motorcyle wire harness and electronics wire harness. 2. ROHS compliant,wire meet UL, CSA, VDE and CE certificated. 3. Strictly QC inspection, passed ISO9001,ISO14001 and TS 16949 Quality control system. 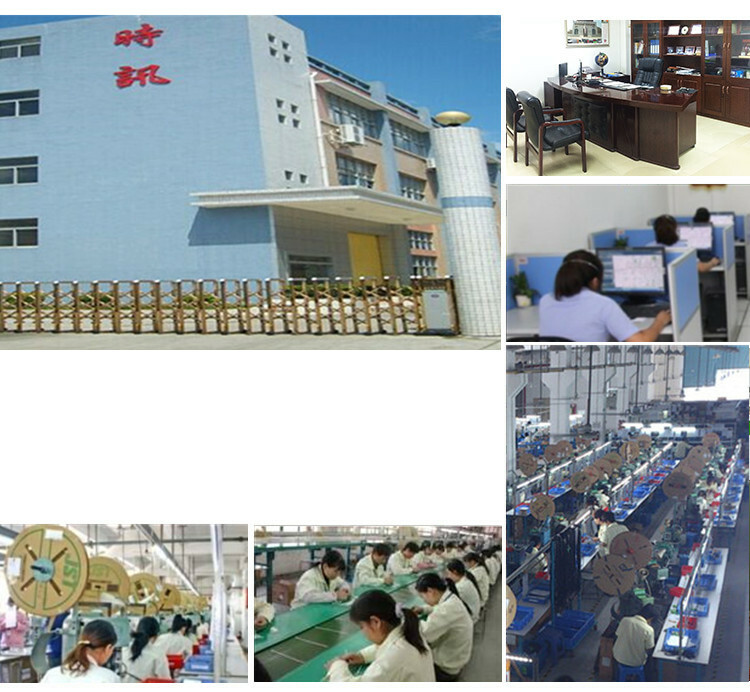 Our company is a professional manufacturer in wire harness industry with 20 years experiences. 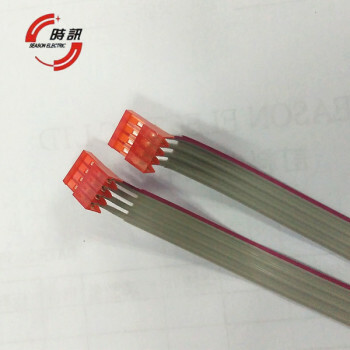 And we’re an agent of JST and Molex connector in South China region.Founded in 2006, we have grown into a leading pioneer in our industry.We have achieved ISO9001, ISO14001,TSI16949 and USA CUL approval certificate,and have had a good sale in America and Europe, Japan. Season Harness and cable assembly plant was establised. Become the authorized molex and JST distributor in Great China Region. 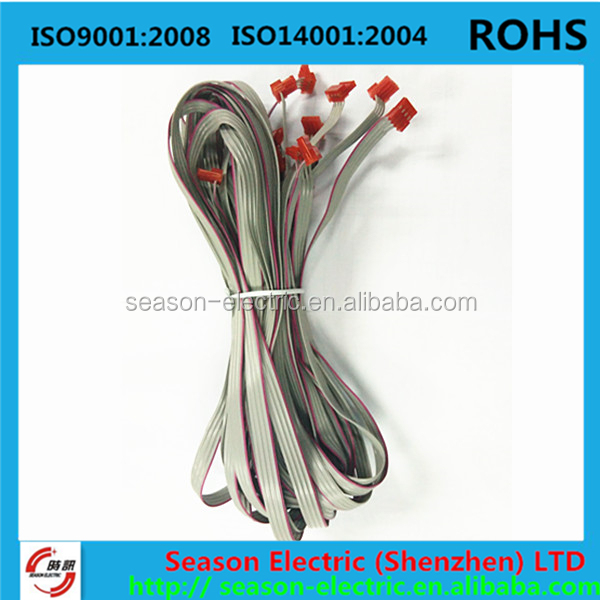 Professional wire harness manafacturer for automotive, home appliance, Electronic, industrial control, medical and so on.And we're also the agent of Molex and JST connector with 20 years. 2. How can I find the connector and wire harness I need? Connector: You can find it by entering your part No.on JST and MOLEX official website. Wire harness:Provide drawings and data, we will customize for you. 3. Is your connector parts new and original ? Yes! Our products come directly from MOLEX and JST, we have 20 years of agency experience. And free samples could be sent for testing,only to pay shipping cost. 4. Are originals connector more expensive than equivalent? That's not right. If your quantity is a lot of enough, the price will be the same as the equivalent or more cheaper. 5. How many years does your company produce wire harness? 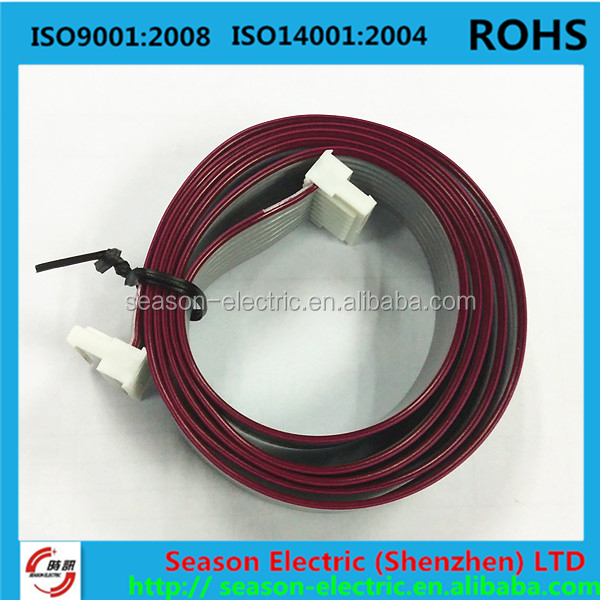 Nearly 30 years ,we started to produce harness and cable assembly since 1988 in Shenzhen.And we formally registered Season Electric Ltd in 2006,now we have had a good sale in America and Europe, Japan, Taiwan various regions. Don’t worry,our factory have 15000 square meter for production line and 3000 square meter for warehouse.400 skilled workers,8 engineers,28 quality control team and experienced sales will help our business easily going. 6. Does your company have capability to handle big order? 7. Are these products quality assured? All of our connector are ROHS compliant and high quality. 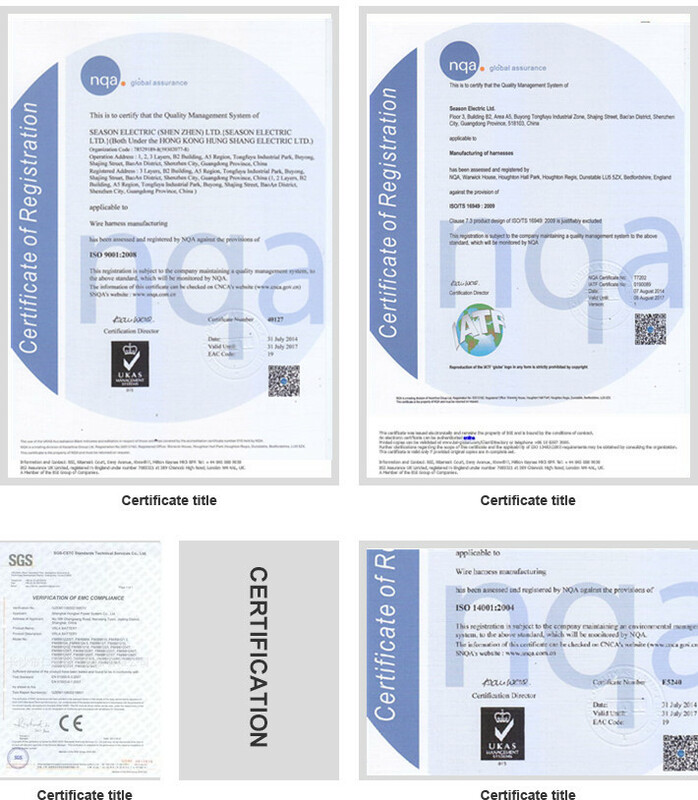 Cable are UL, CSA, VDE, CE certificated.We have strict QC, passed ISO9001, ISO14001 and TS 16949 quality control system , all products are 100% tested before delivery. Our products are produced by Auto industry standards,quality is assured. 8. If I want customized products, how will it work? 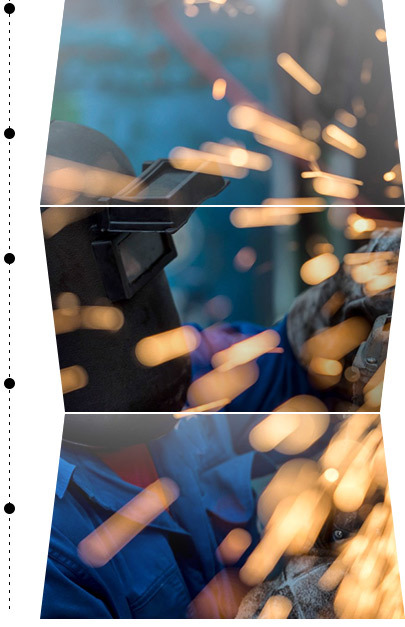 Equipped with professional equipments, technicians & skilled employees, OEM & customized service are welcome. Drawings / samples are required. Of course, purchase quantity should meet our MOQ. Our factory have about 40% spare capacity, your order will be accomplished in time. 9.Do you have enough capacity? 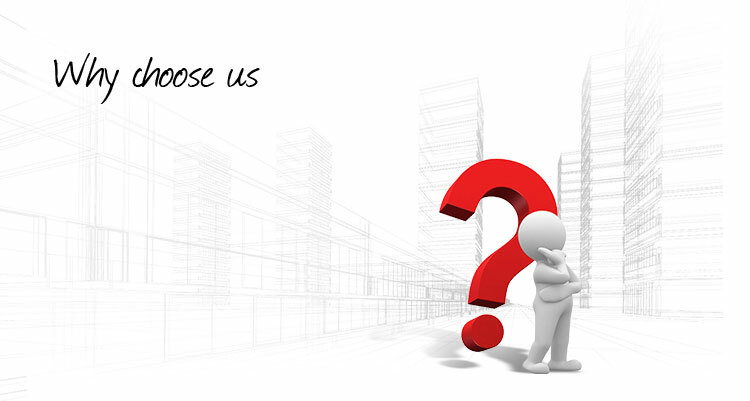 Any question feel free to contact with us . Add: B2 Building. A5 District, TongFuYu Industrial Estate, BuYong Country, Shajing Town, Shenzhen City, CHINA, 518104.